Back Row - Vanessa Lavarello, Judith Green, Joanne Green, Beverley Swain, Louisa Green, Nora Swain, Rose Glass, Denise Rogers, Elizabeth Rogers, Wendy Green. 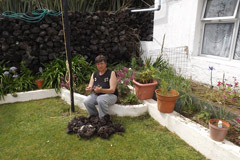 Knitting has been an important part of island life on Tristan da Cunha for nearly 200 years - since the first settlers arrived there in 1816. 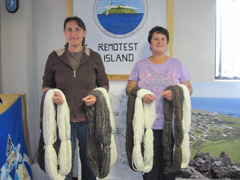 With knitting still playing a significant role, it was decided in 2012 to create a brand for the island's wool garments. The islanders called on a number of experts around the world including UK fashion journalist Jane Garner who guided the Tristan team through the naming process. 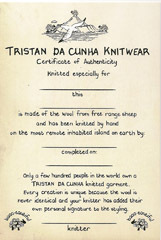 First they had to come up with a brand name for the island's unique woollens and this was created through a competition on the www.tristandc.com website. 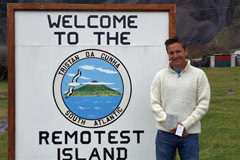 The winner was Alan Ashworth from the UK who came up with the name '37Degrees South'. He was awarded with an island wool knitted hat which he received by post shortly after his success was announced. The next step was the brand's artwork, including bespoke certificates to be signed by individual knitters. This was developed by artistic islander Poppy Lavarello who came up with two brilliant options. One design will be used for on island sales and the second design for international sales. A rubber stamp maker was contacted in Cape Town who placed both designs onto hand stamps to enable the knitwear team on Tristan to produce knitwear tags on the island. Individual cloth labels also had to be produced and hand sewn onto each knitted item. These were also procured from Cape Town, again depicting Poppy's artwork. A certificate to accompany each garment was designed and printed. This confirms the authenticity of the knitted item, the name of the knitter and the date it was completed. After many months everything is ready. I would like to thank Jane Garner (UK fashion journalist) who gave us the inspiration, Chris Bates (UK Representative) , Marina Burns (Museum volunteer), Iris Green (Postmistress), Tina Glass (Tourism Officer) and Sean Burns (the island's Administrator), who gave valuable information along the way that has enabled us to complete this great branding for Tristan. The island sheep on Tristan live a quiet and peaceful life where they... hear no evil, speak no evil and see no evil. 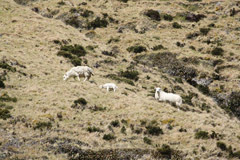 Because of this their wool produces the purest and softest yarn. Every year before Christmas we have our annual shearing day. Each family finds their sheep, hand shears them, puts pretty colour paint on them and releases them into the green pastures. and hand spun to ... ...produce 'wosted'. 'Wosted' is the island name for our unique yarn. 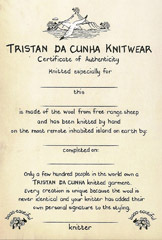 or skein of wool created on Tristan ...will be shipped all over the world from us to you. All authentic 37 Degrees South knitwear items will have a logo attached. The tradition of knitting on the remotest inhabited place on earth spans more than two centuries. Knitting to this day remains a very important part of Tristan life. 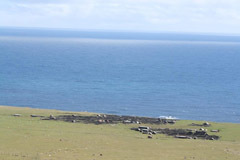 In 1816, a British garrison was set up on the island as a precaution to prevent it being used as a base of operations for the rescue of Napoleon from St Helena, 1500 miles north of Tristan da Cunha. The soldiers came well equipped with seeds, plants and various animals - including sheep. Just over a decade later, when American whaling commenced off the coast of Tristan, the ships' crews were largely dependent on Tristan da Cunha and St Helena for food and water, including mutton. 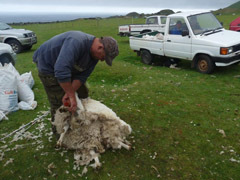 In addition to whaling, the whalers provided a useful link for trading between St Helena and Tristan, with sheep becoming one of Tristan's exports. 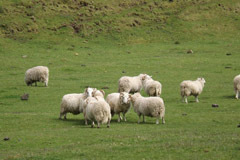 Sheep not only provided the islanders with necessary food, but also supplied the raw material required to produce knitted garments. In the 1800s spinning and knitting local wool - locally called 'wosted' - was the most important domestic industry on Tristan. 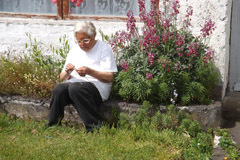 In the early days of production the island ladies made socks, stockings, pullovers and underwear such as men's drawers and bodices for use only on the island. 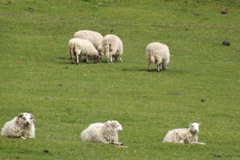 Visible items of clothing were made from the wool of white sheep, leaving the black wool for underwear. Children's clothes were sometimes made from lamb's wool, which was whiter and softer than the ordinary wool. The spinning was carried out on simple home-made spinning wheels, after the yarn was carded, using imported cards. The first spinning wheel on Tristan was said to have been made by Charles Taylor, who arrived in 1838 and left in 1857. The design of the wheel was similar to that of spinning wheels used in Europe in the 16th and 17th centuries. 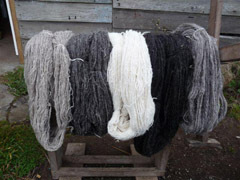 The spun wool was left in its natural state with no washing, bleaching or colouring. By the early 1900s, due to the rise in the number of visiting ships, there was a considerable increase in the quantity and variety of knitted garments produced. These were sold as souvenirs to visitors and included socks, stockings, pullovers or 'gansies' (a local name taken from Guernsey). Parcels sent to friends in England were also said to have contained pairs of socks. 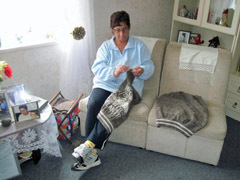 During this period knitting was extremely popular with women of all age groups. Seldom was a woman seen without knitting in her hands, and even small girls knitted with dexterity and speed. Most women took their knitting with them wherever they went – sitting, standing, even walking, they could be seen knitting. However, it was said that they never knitted on a Sunday. Although the Tristan knitters usually followed one of three standard patterns, there was always the opportunity for the garment maker to use her imagination to add a personal touch to each piece of clothing. 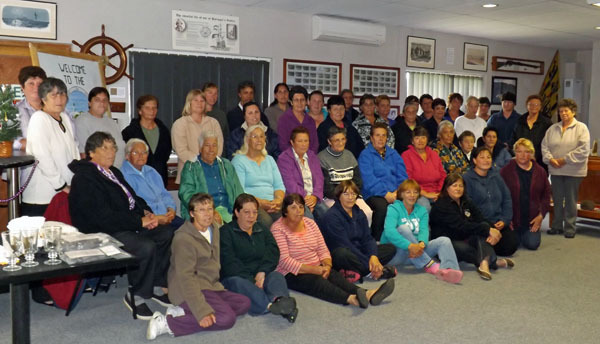 Sheep Shearing Day, held in December, is a family event. All male islanders over the age of 14 shear the sheep using traditional metal hand sheep shears, while the island children catch the sheep with their crooks. The ladies help mark the animals with symbols using bright paint, so that family members can identify their sheep from far away. 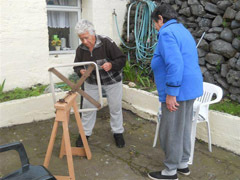 They also provide picnic hampers and help gather the wool in preparation for carding, before which the wool is washed, picked and greased using cooking oil. 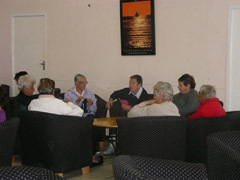 A 'carding party' is another traditional social gathering, usually held in a large space such as a garage. Spinning wheels are set up with breakfast, lunch and tea provided by the hostess. Ladies card and spin all day, stopping only for food and a drink. All the spun yarn is kept by the hostess for no cash payment. This yarn is then washed again before making into balls of wool, ready for knitting. Colours vary from white, cream, shades of grey and brown through to black. 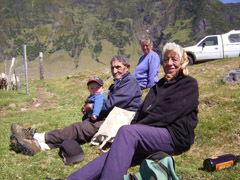 Today, Tristan's knitters range in age from their early 20s to well into their 80s. 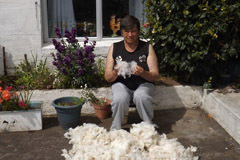 They create a wide range of bespoke garments using yarn, no skein of which is the same. These are worn by islanders themselves, sent as gifts to family and friends overseas, sold to visitors to the island and now exported as a truly unique product.